A robust, classic blend with a deep amber colour, combining the rich maltiness of Assam with the lively edge of Kenyan Tea. A blend of beautifully rich and malty Assam from India and brisk Kenyan strength. Strength No. 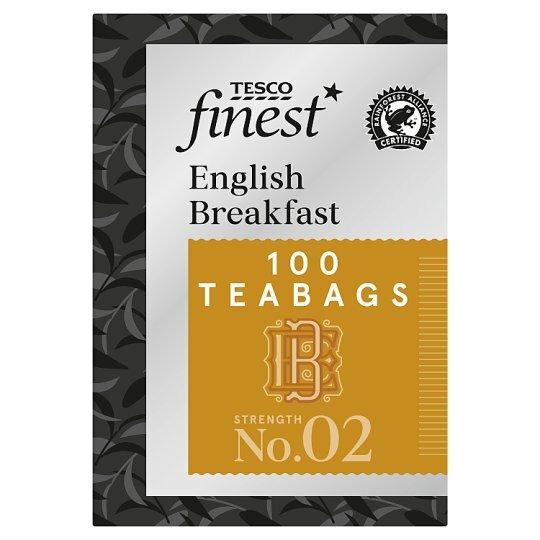 2 Only the highest quality tea leaves are used to create each blend of Tesco Finest tea. They’re sourced from the world’s lushest tea gardens, renowned for their exceptional flavours. Each blend is then perfectly balanced to bring out its characteristic flavour profile. Our tea master ensures every blend is of the same great quality. How to make the perfect cup of tea:1. To enjoy this tea at its best, always warm the teapot first with boiling water.2. Use one teaspoon per person and add one for the pot. 3. Pour on boiling water and leave to stand for 4-5 minutes to allow the full flavour to brew.4. Serve with or without milk.